Narrow gooseneck spout for precision pour control. Durable tempered glass base with touch panel for easy use and cleaning. Signals when desired water temperature is reached. 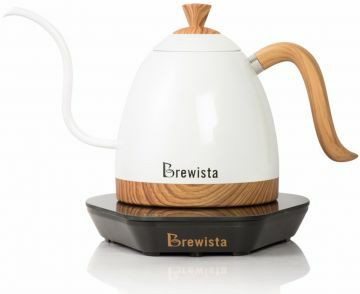 The Brewista Artisan Variable Digital Gooseneck Kettle combines all the features you want in a kettle for maximum control and efficiency. Precise digital control heats water to within 1 degree and can be changed from Celsius to Fahrenheit with the push of a button. The auto-off function keeps the user safe by shutting down if left unattended for more than 60 minutes. The handy 600 ml capacity heats up quickly. 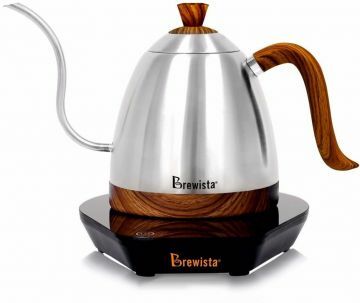 Its narrow gooseneck spout provides amazingly accurate pouring. An ergonomically designed and balanced handle makes it comfortable to use while making perfect pour over coffee!